Yesterday I looked out my office window and saw something in the lower back yard. It looked like a big dark brown rock, but then it moved a little. I thought it might be a cat until it turned towards me and I could see how wide it was. I grabbed the camera and ran outside to try and get a better look to determine what it was. Indeed, it was a groundhog, and he was as curious about me as I was about him. It ran towards me a bit and poked around to see me. 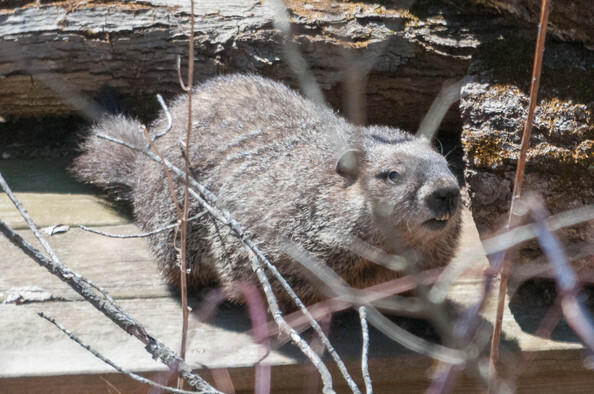 Of course, the ground hog was still a solid hundred-plus feet away — so we weren’t that close — and even at 400 mm (with teleconverter) I had to crop quite a bit to get this photo of it.